Civil society groups in Karen State last week discussed concerns that the official ceasefire monitoring body may restrict their peace-related activities. 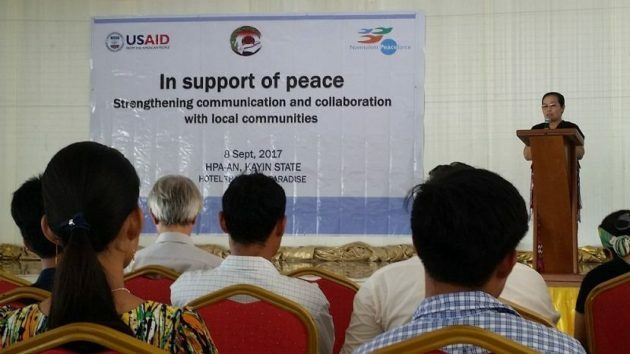 At a meeting held by the Kayin Women’s Empowerment Group (KWEG) and Belgium-based Nonviolent Peace Force in Hpa-an on September 8, some organizations said that with the official ceasefire mechanism setting up local-level offices, the CSOs involvement may be seen as redundant, or as meddling if they run against the status quo. “The CSOs are doing ceasefire monitoring. We are cooperating [with the JMC]. The JMC also has its own agenda which needs to be carried out,” said Mann Thein Zaw, chair of THWEE Group from Kawkareik township. The first local-level joint ceasefire monitoring office was established last month in Hpapun township. The eight-member body is comprised of three representatives from the government, three from ethnic armed organizations and two from the local community. Groups present at the September 8 conference emphasized the need for strong community voices to be appointed to the local-level JMC bodies. “The government will select representatives that share the same view as them. The ethnic armed groups will do the same. So one thing I want to advise is that no matter who is selected as a [community] representative, he or she must understand the peace process very well. If they are a capable representative, I believe they can cooperate with the CSOs,” said Saw Ka Lo Htoo, chair of the Hsar Mu Htaw Group. According to the provisions in the nationwide ceasefire agreement, the JMCs should seek the advice of local political parties, religious leaders, village leaders and CSOs in trying to implement peace. Nan Myint Tin, from the Kayin State-level Joint Ceasefire Monitoring Committee (JMC-S), said the CSOs and JMCs are natural collaborators. “The public wants peace. The CSOs want to bring peace. So we must [together] transparently, accurately and in an unbiased way report on what’s happening in the regions,” she said.